Friends in Toronto: do you hate that I write about fun local events only after they happen? This weekend was the Taste of Little Italy street festival. 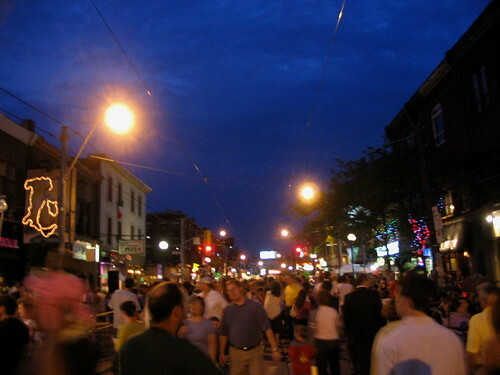 College Street was closed off for three days, allowing restaurants and musicians to take over. 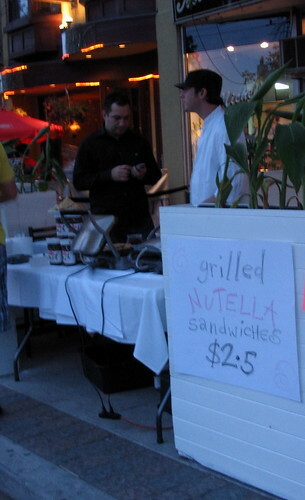 The second picture there shows, yes, grilled Nutella sandwiches! They looked delicious on lovely panini bread, but in the summer weather I just wasn't in the mood for a hot, heavy, sticky sandwich. I vow to try this at home another time. Mmmmmm, Nutella: one of the world's tastiest substances. 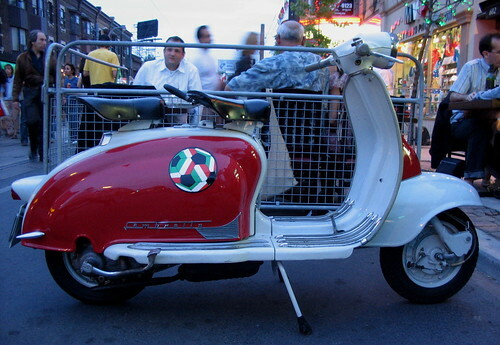 On the topic of "little" and "Italy", did you know that 2006 marks the 60th anniversary of Vespa? 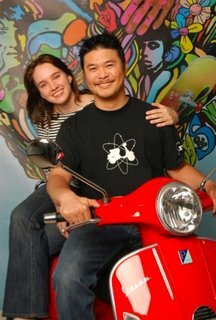 Last week, my Vespa-riding date took me to a fun, exclusive party at the glamorous headquarters of Vespa Canada. It was very hip: martini bar, bruschetta bar, a wandering guy handing out gelato... There was even a draw for a shiny new red Vespa! Sadly, I didn't win although I was certain I would. I'm just going to have to start saving up my pennies so that I can get my own scooter some day (just as soon as I pay off my Japan trip and replace my aging computer). PS An update on the flag spotting game: I can add Australia, Costa Rica and Iran to my earlier list. That makes 25 of the 32 participating nations! Still looking for: Cote D'Ivoire, Serbia/Montenegro, Paraguay, Suisse, Tunisie, Saudi Arabia and the USA. Betcha I never see any American flags, though!